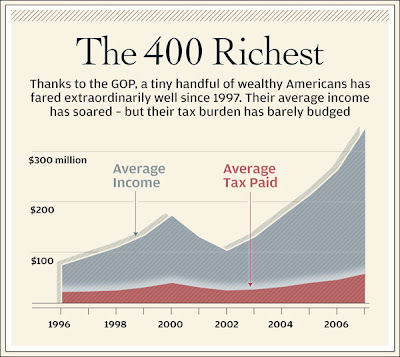 This chart from Tim Dickinson's Rolling Stone article "How the GOP Became the Party of the Rich," shows how the richest 400 Americans have faired under regressive tax policies ushered in by Republicans starting with President Ronald Reagan 30 years ago. 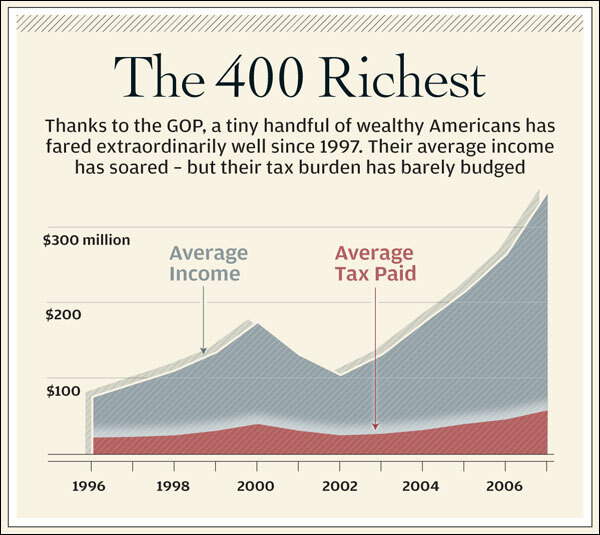 Are the rich paying their fair share in taxes? The numbers say the richest Americans have been getting a free ride. According to Nobel Prize-winning economist Joseph Stiglitz, "Most Americans got none of the growth of the preceding dozen years. All the gains went to the top percentage points." One of the basic tenets of Reagan's aberrant theory of trickle-down economics is that cutting taxes for the wealthy will stimulate the economy and lead to increased hiring. After 30 years of Reaganomics the net result has been huge deficits and the rich getting richer. 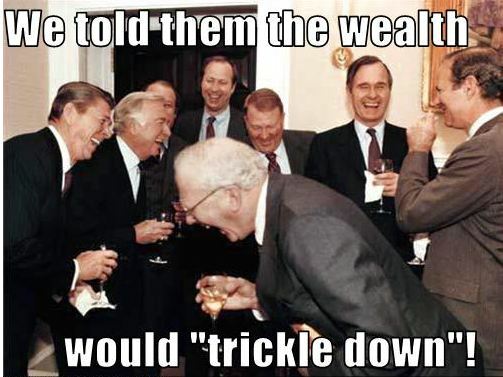 Tax cuts went into the pockets of corporations and the richest Americans, not into the economy and not into new jobs. Instead we have historically high unemployment, historically high income divergence, and an historically high wealth gap.